Following clinching Utah State Route 12 over the Grand Staircase I turned east on Utah State Route 24 heading towards Interstate 70. UT 12 has an east terminus at UT 24 in the Town of Torrey located in Wayne County. UT 24 is an approximately 163.3 mile east/west State Highway starting from US 50 in Salina at it's western terminus and ending at I-70/US 50 in the San Rafael Swell of Colorado Plateau. Unlike most of the Utah State Highways I've covered on the 2016 Fall Mountain Trip series the designation of UT 24 dates back to the early days of the Utah State Highway system. UT 24 was designated in 1927 by the state legislature along a previously unsigned State Highway from US 89 in Sigurd to Hanksville. 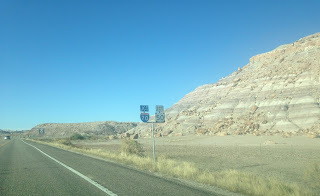 In 1935 UT 24 was extended from Hanksville to US 50/6 west of Green River. In 1964 the east terminus of UT 24 was cut back to it's present location at I-70/US 50. 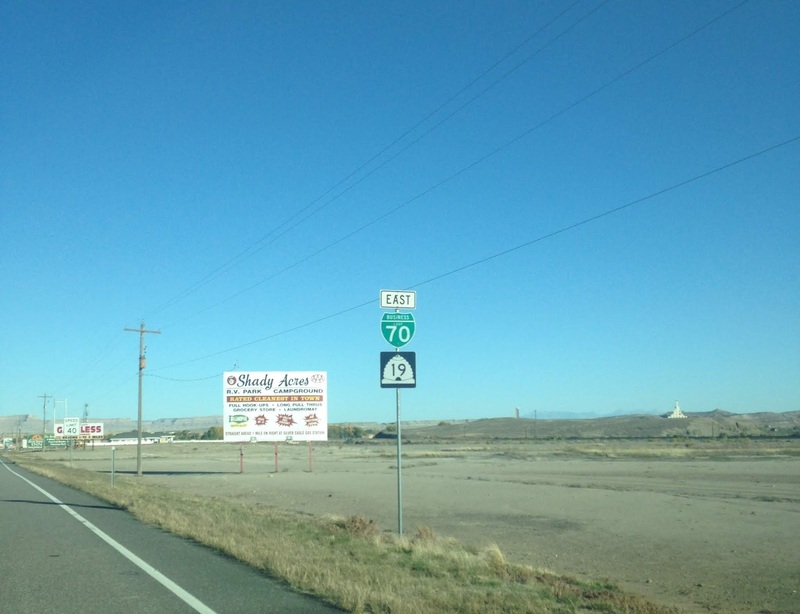 UT 24 had it's western terminus extended to Salina in 1969 co-signed on what as the surface alignment of US 89 at the time. 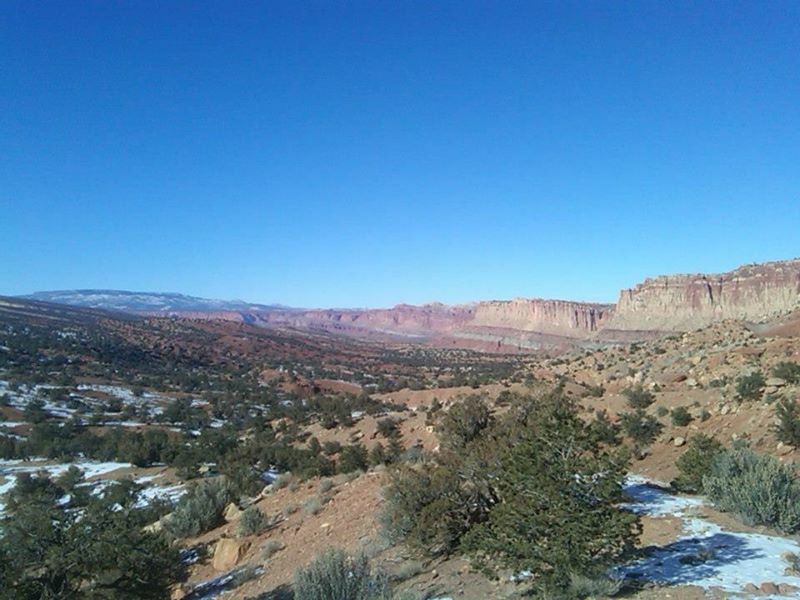 UT 24 today barely traverses the northern extent of Capitol Reef National Park but that originally wasn't the case. 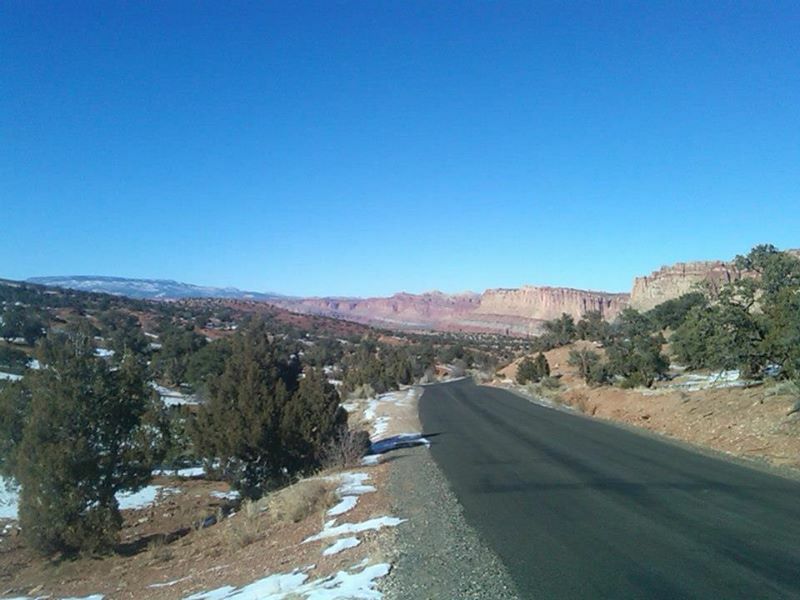 The original alignment of UT 24 in Capitol Reef National Park utilized what is now Capitol Reef Scenic Drive south from Fruita to Capitol Gorge Road. UT 24 traveled north east along Capitol Gorge Road following Capitol Wash to Notom. From Notom UT 24 continued northeast along what is now Old Notom Road to the present highway alignment. This older alignment through Capitol Reef National Park was replaced in 1961 but can be seen on the 1950 State Highway Map. East of Torrey UT 24 follows Sulphur Creek into Capitol Reef National Park. I stopped at Panoramic Point overlook for a view of Waterpocket Fold. The Waterpocket Fold is the main geographic feature of Capitol Reef National Park and is a nearly 100 mile north/south dip in the Colorado Plateau. Capitol Reef National Monument was declared in 1937 and was elevated to a National Park in 1971. UT 24 meets it's former alignment along Capitol Reef Scenic Drive in Fruita. Fruita was originally known as Junction when it was founded in 1880 due to it being located at the confluence of Sulphur Creek and the Fremont River. Fruita came to be known by it's modern name circa the first decade of the 20th Century. Fruita now houses National Park Service workers but have a historic district which can be traversed via Capitol Reef Scenic Drive. In 2016 I was largely just passing through Capitol Reef National Park but in 2013 I did explore Capitol Reef Drive far more extensively before encountering engine problems. 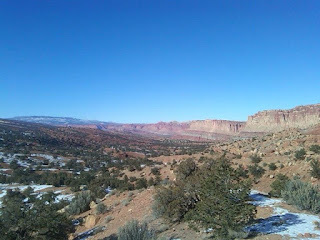 These photos are along former UT 24 on Capitol Reef Scenic Drive are south of Fruita heading towards Capitol Gorge. Modern UT 24 follows the Fremont River Canyon out of Capitol Reef National Park into a surreal landscape resembling the Painted Desert of Arizona. UT 24 eastbound enters the small community of Caineville along the Fremont River and follows it to the Giles ghost town. Giles was located on the north bank of the Fremont River and was first inhabited by Mormon Settlers in 1883. A proper town site grid wasn't plotted out in Giles until 1895 and the community reached it's peak of 200 residents by 1900. Flooding along the Fremont River in 1909 and 1910 led to the decline of the community due to irrigation division being impractical. By 1919 the town site of Giles was reported to be abandoned. 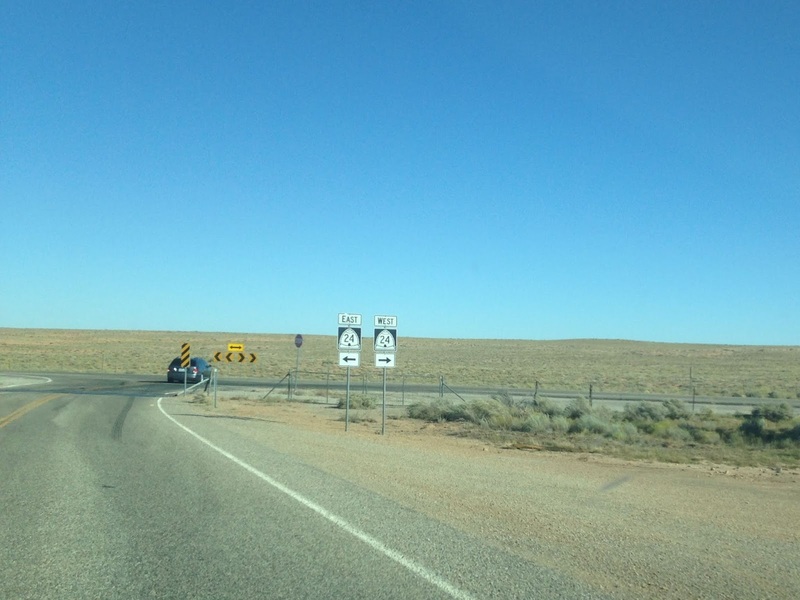 In Hanksville UT 24 has a junction with the west terminus of UT 95. UT 24 takes a northward swing out of Hanksville and over the Fremont River headed towards I-70/US 50. UT 24 eastbound enters Emory County and has various overlooks of the surrounding canyon lands. I turned away from UT 24 on Temple Mountain Road and Goblin Valley Road headed west towards Goblin Valley State Park. The final 1.770 miles of Goblin Valley Road within in Goblin Valley State Park are actually part of the unsigned UT 303. UT 303 was completed in 1972 and allowed easier road accessed to the Carmel Canyon Trail. Utah has various State Highway designations largely in the 200-300 range which serve State facilities. The main feature of Goblin Valley State Park is the heavily eroded hoodoos which are known as "Goblins." The hoodoos are similar to those seen in Bryce Canyon but has the sandstone layer weathered away. Goblin Valley State Park was established in 1964 and is known for it's somewhat freestyle trails among the weather hoodoo goblins. After leaving Goblin Valley State Park I returned to UT 24 via Goblin Valley Road and Temple Mountain Road. North of Goblin Valley State Park I reached the east terminus of UT 24 at I-70/US 50. 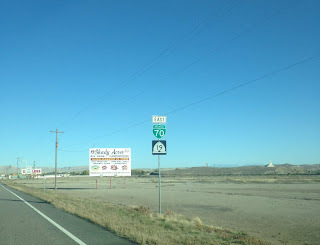 I followed I-70/US 50 eastward picking up US 6 and US 191 on the outskirts of Green River. 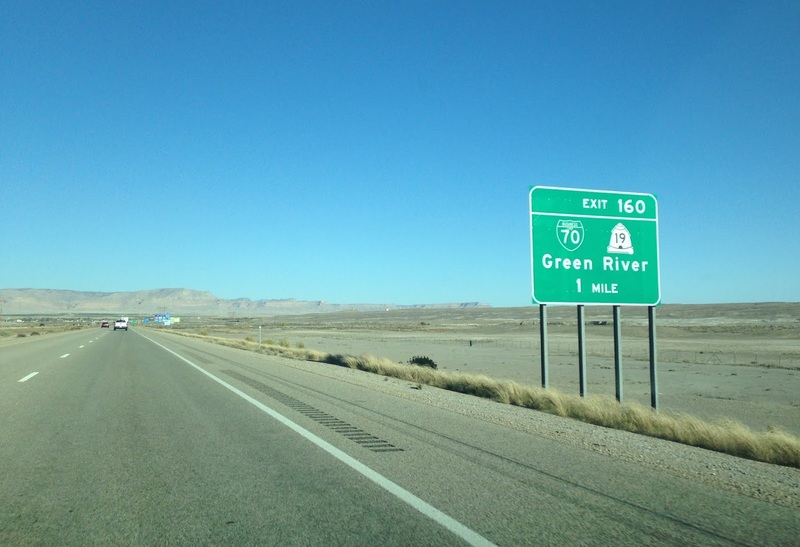 I followed I-70/US 50/US 6/US 191 into Green River where I stayed the night at along the I-70 Business Loop on UT 19. UT 19 is 4.5 mile State Highway almost entirely signed on the former surface routes of US 50/6/191 in Green River on Main Street (a small section east of the Green River was not part of this alignment). UT 19 was designated in 1969 but it wasn't until the 1980s that I-70 would bypass Green River.